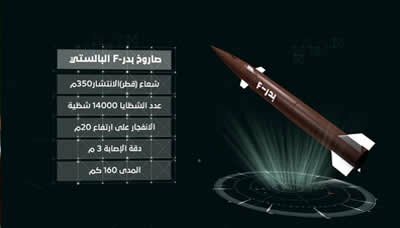 Houthi group "Ansar Allah" in Yemen, on Tuesday, announced the manufacture of a new ballistic missile called "Badr F" entered the battlefield in front of Yemeni forces supported by the Saudi-led Arab military coalition in a step that increases the possibility of escalation of fighting between the warring parties in this poor country that is in a bloody war for the fifth consecutive year. During a press conference held in the capital Sanaa, the spokesman reviewed pictures of the new ballistic missile (Badr-F), which is locally developed and is similar to the Russian missile Tochka in all its specifications. He said: "The Badr-F missile’s range is 160 km and explodes at a height of 20 meters, and its shrapnel amounting 14 thousand scatter in a beam of 350 meters." The Houthis say they fire ballistic missiles and UAVs at Saudi lands in retaliation to coalition strikes on its forces and civilian targets in Yemen.